Phuong Nguyen is a banking, finance and corporate lawyer with over 19 years of experience in banking and financial, corporate, commercial and global trading matters. Phuong Nguyen is knowledgeable in all aspects of banking and finance, investments and business operations in Vietnam for local, foreign and multinational corporations and banks. This includes all types of projects and transactions including infrastructure projects, for which she provides guidance on legal issues, investment structures, tax considerations and foreign exchange issues. In 2014, IFLR1000 listed Phuong Nguyen as a leading Banking & Finance lawyer. She has been nominated as a leading Financial and Corporate lawyer by IFLR1000 (2011-2013). 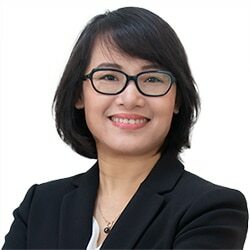 According to Chambers Global 2011, “Mai Phuong Nguyen is a talented finance lawyer and is carving herself a strong reputation in the market”. As described by Asialaw 2010, “Mai Phuong Nguyen provides immense expertise in financial matters”. She is also a lawyer highly acknowledged by the Asia Pacific Legal 500. Phuong Nguyen is a member of the Vietnam Lawyer Association and Vietnam Bar Federation. Prior to joining the firm, Phuong Nguyen was with Mayer Brown JSM Vietnam for nearly 10 years.